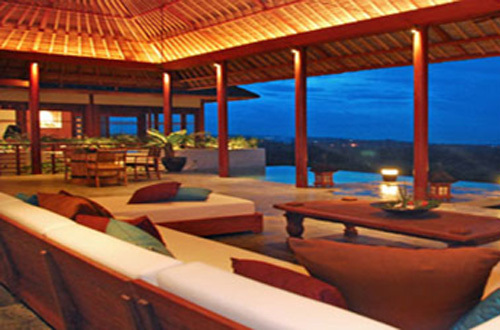 Nestling in privacy of Jimbaran Ungasan area and maximizing the ocean view this new 6 bedrooms villa is ultimate in elegance, comfort, decoration and service. Stunningly located on the top of the hill overlooking Jimbaran, The Long House boasts the most 180 degree view of endless blue of the Indian Ocean and the volcanoes. 20 minutes from the Airport, and only 10 minutes from Nusa Dua and Jimbaran beach renown for its fine sea food restaurant and fish market and about 30 minutes from Seminyak, a vibrant tourist area with its choice of restaurants, boutique, and nightlife The Long House is perfectly situated to enjoy all the facets of Bali.